The EDGE is our entry-level model, but offers you world-class sound quality and features, and achieves its affordable price by asking you to do a small amount of simple DIY to add ripping and storage (if you need it). The EDGE is a new approach to providing an entry model, where you get fantastic sound quality at a budget price, by omitting the ripper and storage. 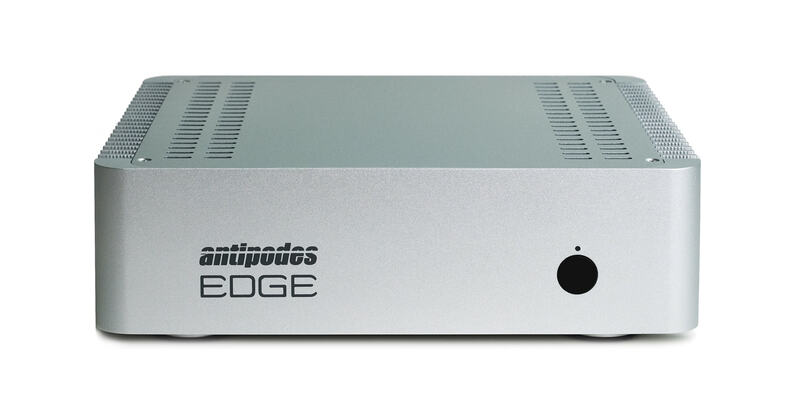 The Antipodes EDGE uses the same V3.5L cicuit, and the same external Level 1 ODAPS linear power supply and solid state storage, as was first introduced in the DS GT (now withdrawn). In fact, you can think of the EDGE as a DS GT without the integrated ripper and without the pre-installed solid state storage. And we have made adding ripping capability and storage very simple for you to do yourself. Many of our customers either have a NAS or have recently moved to digital to enjoy internet streaming services like TIDAL. So you can use the EDGE without adding any storage, by streaming files from your NAS and/or the internet. If you wish to add storage, you can add one or two Samsung EVO 2.5″ 7mm Sata SSDs (available up to 4TB each, so a potential total storage of 8TB), slide them in the rear slots of the EDGE and organise a service call for us to log in remotely and setup your storage. The high volume computer industry supply chain can supply you SSDs at a much lower cost than the low-volume high-end audio supply chain, and you don’t have to send the EDGE anywhere to fit an upgrade to your storage. The first storage setup is free. Subsequent changes to storage incur a fee for the remote service call, and this is much more convenient and lower cost for you than having to send your EDGE away for a few days to one of our service centres to add storage. Many of our customers don’t need a ripper. They may have already ripped their collection and be acquiring their music online now. Or they may have another device that can do high quality ripping. But you can simply add a USB CD/DVD drive from a computer store, and plug it into the EDGE to use our auto-ripping app, which ensures the best possible rip is achieved. The ripping software reads every sector twice and only moves on when the rips are identical. If there are differences the rip speed is reduced in steps till two identical rips are achieved. In this way, the actual optical drive you use has less influence on the rip quality. We will shortly be launching ripper hardware that provides excellent ripper quality and reliability for adding to the CORE or EDGE. Some customers have asked if our low-noise approach is also critical for ripping, and the answer is no. Because the rip is being stored semi-permanently on a storage drive, the stored data is just the 1s and 0s – no noise or jitter is stored. Noise and jitter only become issues during playback. Note that the claims that buffering and regenerating during playback achieves the same immunity to noise and jitter as semi-permanent storage are utterly false. The EDGE uses our V3.5L Celeron circuit and can run nearly all features in demanding Server apps like Roon Server. But some processing features in Roon will not be able to be used, such as transcoding/upsampling to high DSD rates. The CORE is an alternative to the EDGE that provides high processing power. Or you can use a CORE as a separate Server to play to an EDGE as a Renderer, and this combination not only provides high processing power but also lifts sound quality. Adding a CORE to an EDGE will improve sound from top to bottom, but the improvement increases as you go down the audio frequencies. The improvement in the bass region is very marked, particularly adding depth, control, detail and timbral accuracy. The EDGE is also an excellent option if you use an Antipodes in your main listening room and wish to extend music in high-end quality to other rooms. Remote EDGEs can play from the library on your main Antipodes.